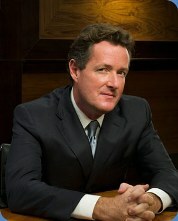 Could Piers Morgan, judge on America’s Got Talent and Britain’s Got Talent and winner of Celebrity Apprentice Season 1, really be slated to replace Larry King on CNN? That’s the news out of several U.K. papers over the weekend. And CNN is not denying it. Part of the past, sure. Part of the future – fine. But that doesn’t address the possibility that CNN is nearing the point where they replace King with someone, and it looks like it’s Piers Morgan…as surprising as that sounds. But taken together, the quotes could tell us a few things: maybe CNN switches up their line-up at both 8 and 9pmET, with Morgan at 8pmET instead. Or if King remains with the network in another role, it could open up the prime time schedule for Spitzer and someone else at 8pmET in a Crossfire-type show and Morgan at 9pmET.